Management of inventory is not an easy task; you need to be careful when you work with inventory management. Textile and garments industry is huge in terms of volume of production as the demand for clothes is increasing day by day. 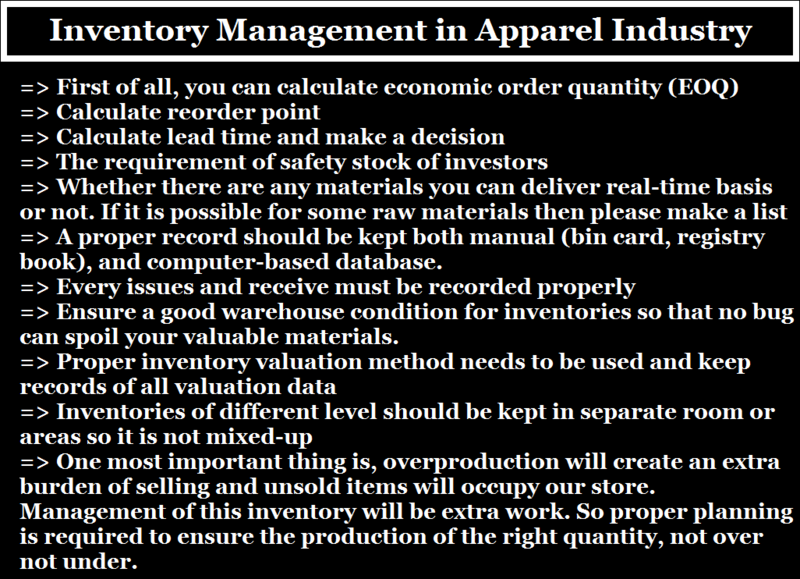 In an apparel industry, you may have to keep inventory in different forms. It can be of raw materials or finished goods. Because of the extra burden of improper inventory planning every year apparel industry incurring a huge cost which ultimately decreasing the profitability of that company. Sometimes they lost their price competitiveness because of poor inventory management. I was talking with a manager of renowned garments, he told me that because of improper inventory management system we had too much wastage or damaged inventory. Which ultimately decreases our profit margin. Now we are concern about it and trying to develop a good inventory management system. Here in this article, I will try to give you a general guideline of how you can ensure good inventory management in the apparel industry. First of all, you can calculate economic order quantity (EOQ), but here the problem is to determine the annual demand. It is too tough but if you were doing business for many years and you have all your previous year demand records then you can decide what will be the future demand. All you have to do is to increase the value of demand with the annual growth of your business. Here economic order quantity indicates a specific order quantity where the total cost of ordering and storing is minimum. Example: Suppose last few years your annual demand of a particular material was 200 MT. And with the increase in your production, this demand is increasing by 20%. So for next year, you can assume that your annual demand will be 200 + (200 x 20%) = 240 MT. 2. Calculate reorder point: Place order when inventory stock reaches to a particular level. 3. Calculate lead time and make a decision: Calculate how much time is required to place an order and receiving those goods to the factory. 4. The requirement of safety stock of investors: Identify is there any requirement of keeping safety stock or not. If safety stock is required then how much should we keep is to be determined. 5. Whether there are any materials you can deliver real-time basis or not. If it is possible for some raw materials then please make a list of it. 6. A proper record should be kept both manual (bin card, registry book), and computer-based database. 8. Ensure a good warehouse condition for inventories so that no bug can spoil your valuable materials. 11. One most important thing is, overproduction will create an extra burden of selling and unsold items will occupy our store. Management of this inventory will be extra work. So proper planning is required to ensure the production of the right quantity, not over not under. If you want to learn details calculations of different inventory management tools then please let me know. I will try to provide you detail clarification with examples. 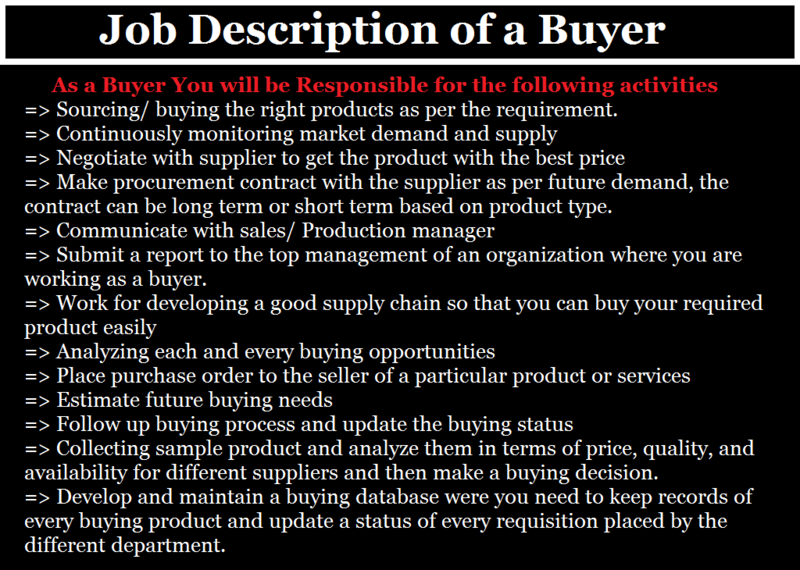 Before discussing buyer job description lets have an idea of who is a buyer. A buyer is a person or a company who is responsible for buying the required product or services for their own use or for reselling. In other words, a buyer is an entity which actually sources and buys a solution for a particular problem. Here in this article, I will discuss the roles and responsibilities of buyers and what qualities will be required to become a good buyer. Sourcing/ buying the right products as per the requirement of the company. Continuously monitoring market demand and supply for your required products. Negotiate with the supplier/ manufacturer to get the product with the best price. Make procurement contract with the supplier as per future demand, the contract can be long term or short term which is based on the product type. Communicate with sales/ Production manager about their requirements. Submit a report to the top management of an organization where you are working as a buyer. Work for developing a good supply chain so that you can buy your required product easily. Analyzing each and every buying opportunities available for a particular situation. Estimate future buying needs of your company. Follow up the buying process and update the buying status of your product. Collecting sample product and analyze them in terms of price, quality, and availability for different suppliers and then make a buying decision. Develop and maintain a buying database were you need to keep records of every buying product and update the status of every requisition placed by the different department. Check and verify all the required specification of purchased products. As a garments buyer basically we mean, person or company buying a bulk quantity of garments products from the manufacturers or suppliers. But this is not only applicable to buying garments products but also buying is required for the manufacturers of garments product. A manufacturer needs to source yarn, fabric, trims and accessories, a coloring agent, printing materials, packing materials, etc. All these buying requirements are fulfilled by the procurement department of a garments factory. You will be responsible for sourcing garments from around the world or locally. Sourcing should be done from a quality manufacturer or your company nominated suppliers. Negotiate with the supplier for sells terms and conditions and buying price. Conduct audit in garments factory as a garments buyer, which is commonly known as the buyer’s audit. You are responsible for ensuring 100% quality requirement made by the company. Place buying order for bulk quantity and follow up the production and receiving process. You will be responsible to find out all prospective suppliers from local and international. Identify which supplier will be good for our buying of raw materials. Here good in terms of quality, cost, availability and lead time. Collect sample, evaluate and finally buy the product (yarn, fabric, dyes chemicals, trims, and accessories) from the suppliers. Develop a good supply chain for buying textile and garments materials. 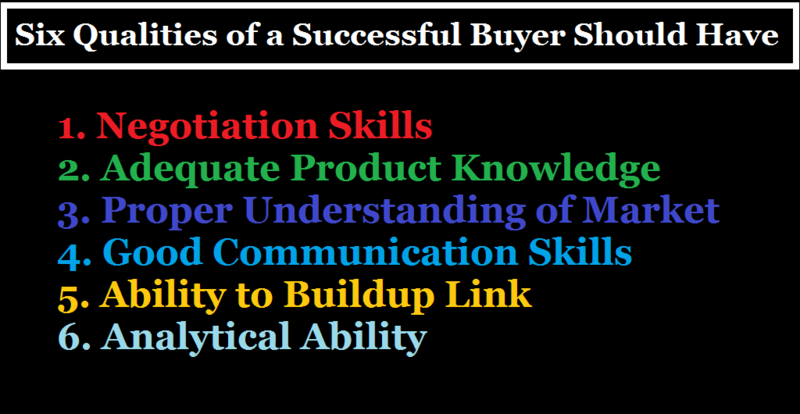 As a good buyer, you need to have 6 different types of qualities and skills. Following qualities may include in the buyer job description which is expected by the employer. Negotiation skills are the topmost priority given quality required for the buyer. Because the employer believes that a good negotiation will help to get the least price for the product. In general, a buyer negotiates with the seller with the price and quality. If you want to become a good negotiator, then you must acquire some key negotiation qualities. Garments buyers give more focus on negotiation as they purchase bulk amount and manufacturer/ supplier has less bargaining power. As a buyer when you want to buy a product you should have proper knowledge of that particular product. So that you can buy the right product, the right quantity at the right price. Product knowledge is all about knowing, where this product is available, how many suppliers deal with this product, how much it can cost and finally how to evaluate its quality. Understanding market demand and supply will be helpful to make a buying decision and negotiation. As a good buyer, you always choose the source or time where the product price is low. Always keep in mind the local and international market so that you can compare the cost associated with the sourcing of that product and choose the right decision. As a price negotiator, you must have the quality of effective communication. Buyers communicate with suppliers or sellers through the mail, phone call, or direct visit (face to face communication). So where to use which language you should know and how effective buying is to be done through the right communication skills you need to be aware of. Here link building means, building your supply chain (procurement channel). If you successfully build up your own channel/link, then it will be easy for you to purchase the right product by giving minimum efforts with maximum benefit. This skill is required to evaluate the suppliers whether they are giving the right products or not, whether they are charging an accepted market price or not. A good analytical skill will help you to analyze the market and buying decision making. Very commonly manufacturing product is trouser in knit garments, generally made by fleece fabric or single jersey, popular clothing in this generation. Trouser sewing total SMV is 8.13 in knit garments. 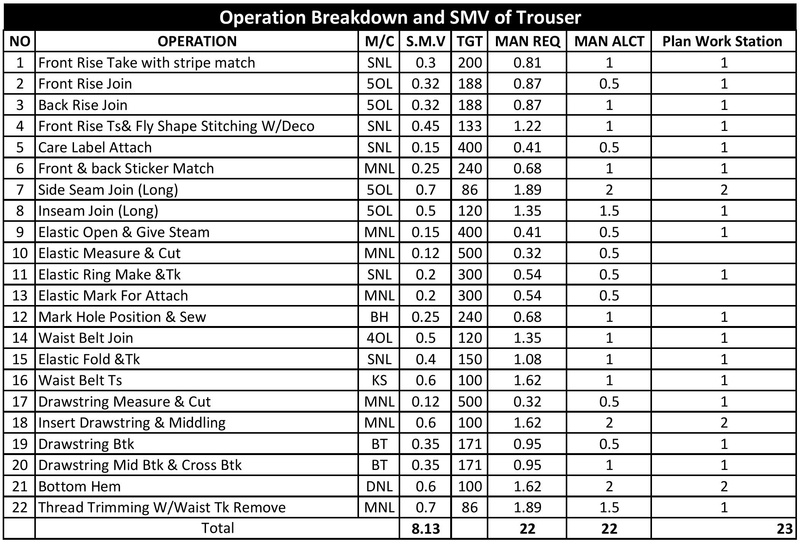 Here in this article, I am going to share Operation Breakdown and SMV of Trouser with all necessary data. Industrial engineering (IE) plays a vital role in the apparel industry, that’s why Industrial engineering job roles are very important for garments factory. When we need to reduce cost and improve work efficiency in this competitive era, the apparel industry hires an Industrial Engineer to do that job smartly. Apparel manufacturing industry is growing quickly by applying IE in their facility. 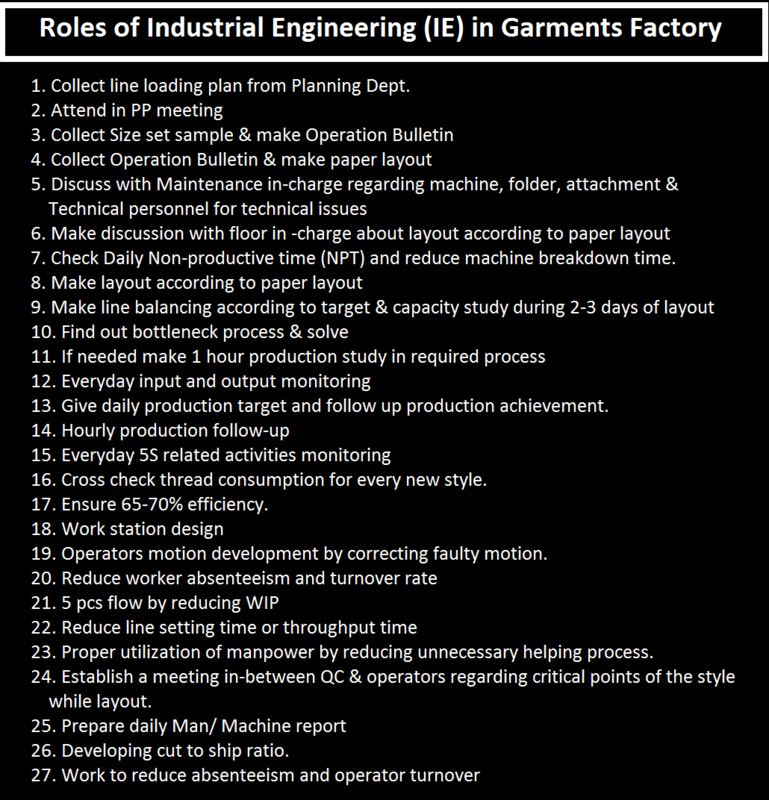 I this article I am giving a list of IE activities in garments factory which will help you to understand the Roles of Industrial Engineering in Garments Factory. Process improvement by motion reducing. Reduce work in process (WIP) and remove the bottleneck. Fill up Key Performance Indicator (KPI) target. Evaluate operator and staff performance, disciplinary matters, training needs, and their career development. Set the target and make a draft, layout design of the machine requirement, material flow, and workstation to bring the best possible efficiency. Modern tools are used to design of the layout. Monitor factory performance in terms of quality, delivery, cost-efficiency and target improvements with the internal factory team and taking necessary corrective action. Manpower balancing, target setting, and monitoring achievements. Collect size set sample and make operation bulletin accordingly. Discuss with Maintenance in-charge regarding machine, folder, attachment and Technical personnel for technical issues. Check Daily Non-productive time (NPT) and reduce machine breakdown time. Give daily production target and follow up production achievement. Cross check thread consumption for every new style. Ensure up to 65%-70% efficiency. Operators motion development by correcting faulty motion. Reduce line setting time or throughput time. Proper utilization of manpower by reducing unnecessary helping process. Establish a meeting in-between QC and operators regarding critical points of the style while layout. Developing cut to ship ratio. Polo shirt is a special type of shirt which has a collar and a placket with two or three buttons, different from a T-shirt, also have a pocket. Polo is also made of knit fabric like T-shirt but different types of design. Total SMV of Polo Shirt is 10.39. 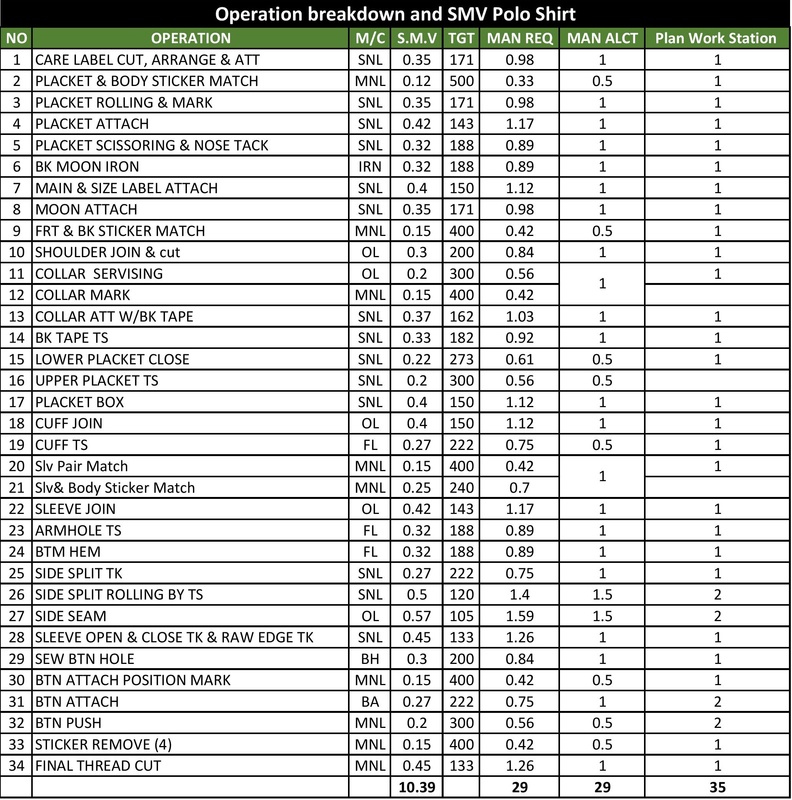 This operation breakdown includes a list of operation, machine list, SMV of every single operation, the production target of polo shirt manufacturing in the sewing section. Hopefully, after reading this article you will have an idea of detail Operation breakdown and SMV Polo Shirt. T-shirt named for its T shape, collarless and short sleeves. Generally, a T-shirt made by light cotton fabrics, very comfortable to wear, casual wearing dress. A T-shirt is more comfortable than Polo shirt, male and female both can wear it. This article is all about T-shirt manufacturing, operation breakdown of T-shirt. Total SMV of T-shirt is 8.41. From this article, you will know, list of operation, machine list, SMV of every single operation, the production target of T-shirt manufacturing in the sewing section. 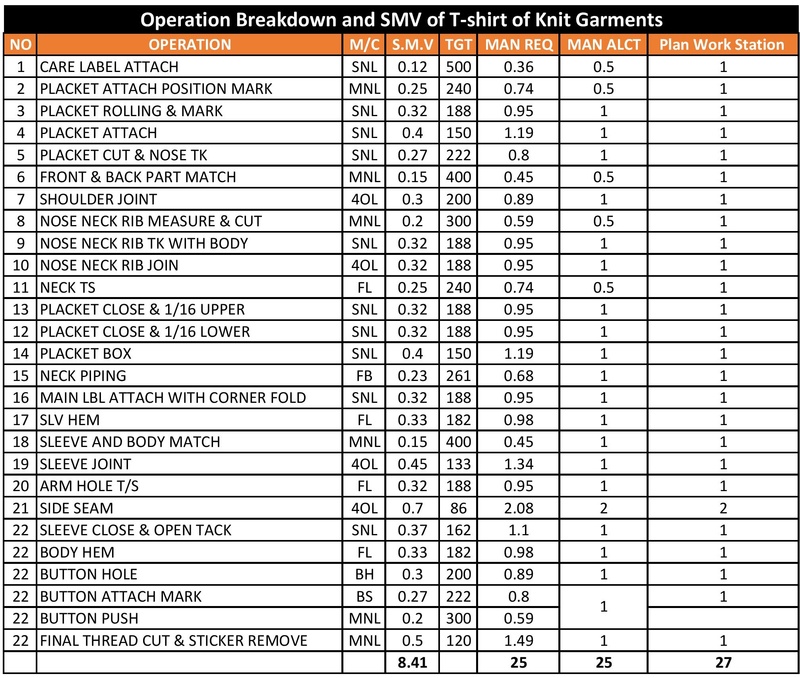 So, let’s have a look at Operation Breakdown and SMV of T-shirt of Knit Garments. Cargo Pant: Cargo Pant is a pant includes cargo pocket, generally loose-fitting, comfortable casual wear. Cargo Pant can be the long and short type of. Here SMV, total SMV found 36.28 which can be varied factory to factory. 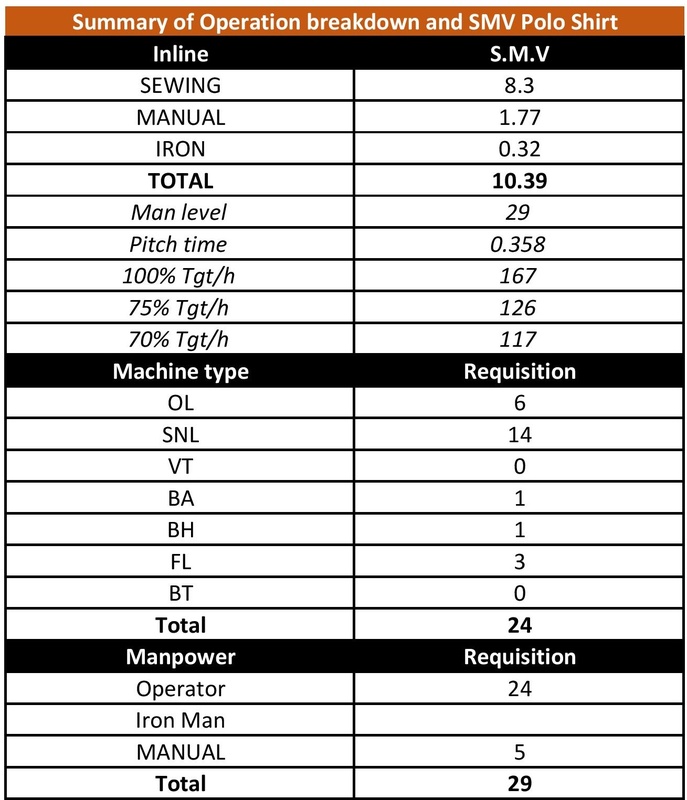 This data will give you a clear idea about the list of operation of cargo pant and their SMV. For a cargo pant, you may find more process are involved than 5 pocket pant. 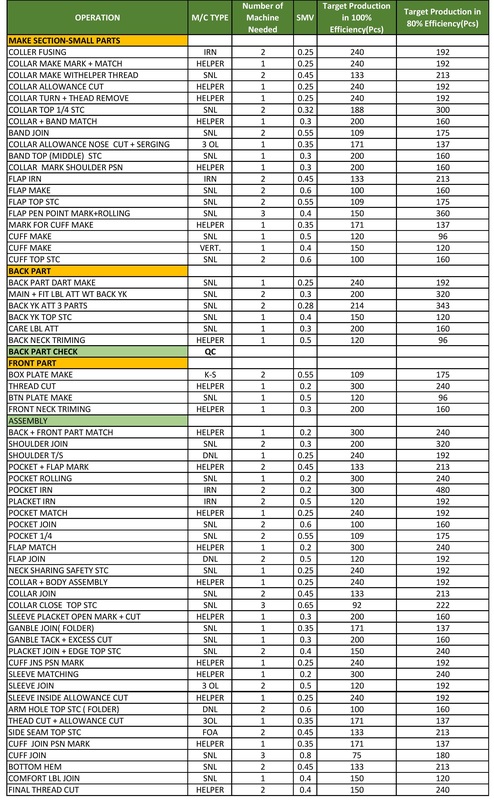 Hopefully, Operation Breakdown and SMV of Cargo Pant which be helpful for you. 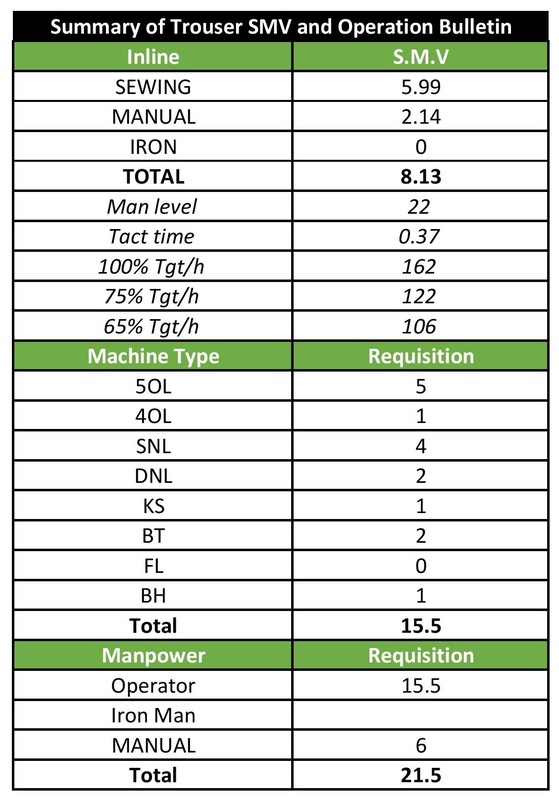 Operation Breakdown for Garments Manufacturing: Operation breakdown is a list of processor operation in sequence wise with SMV or SAM and machine Helper list. 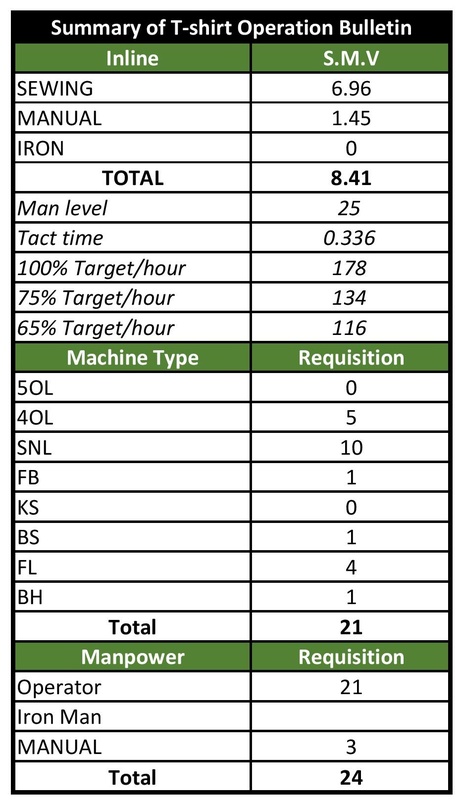 Style-wise operation breakdown is done by an industrial engineer in an excel chart. 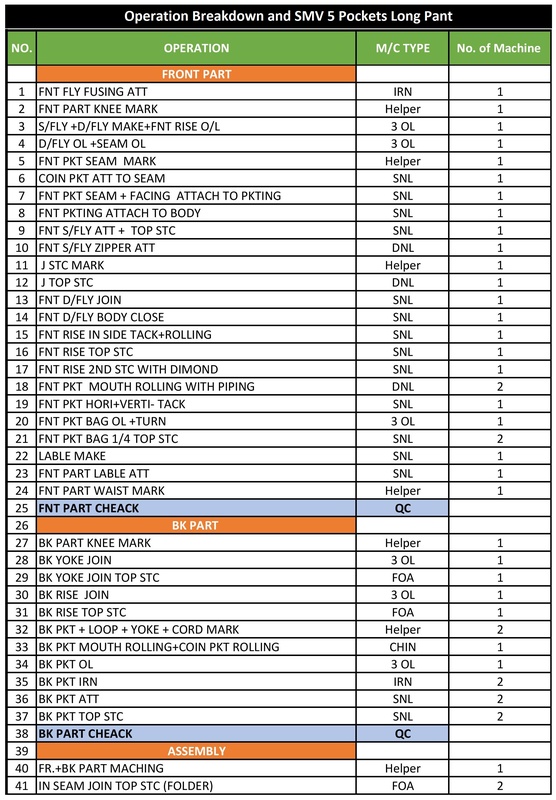 Operation breakdown report help to set the line layout of every style. For your better understanding, I made an Operation Breakdown and SMV of Men’s Long Sleeve Shirt in an excel sheet. Garments Quality GM: A quality DGM, AGM or GM is the head of quality in an apparel industry, who is responsible for leading the whole department from the supreme position. It is the top designation of apparel industry like production/operation GM. A quality GM is the utmost responsible person for any quality issues in the apparel industry. It’s very important to know about Quality GM job responsibility for every quality related person as our dream to be Quality GM, highest stage of career. 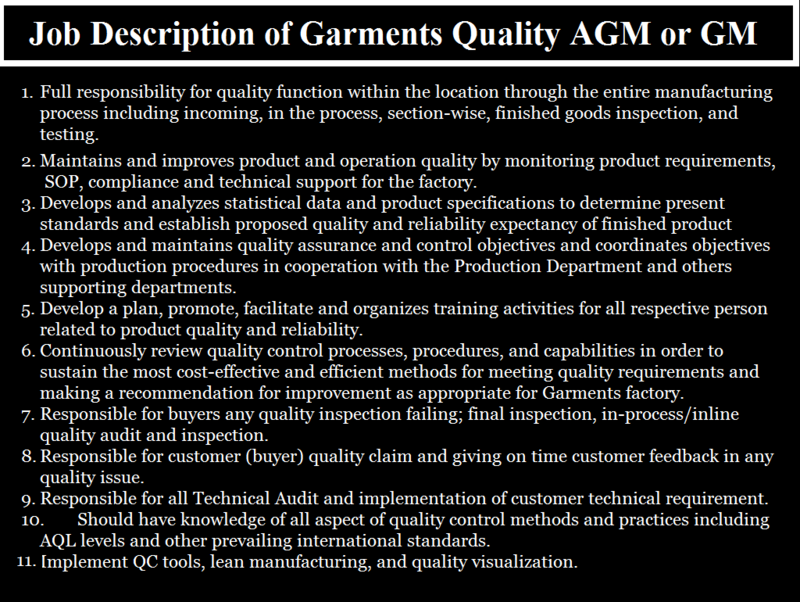 Job Responsibilities of Quality AGM or GM in Apparel Industry is the indicator of what qualification is required to become Quality GM and where the focus is needed. Full responsibility for quality function within the location through the entire manufacturing process including incoming, in the process, section-wise, finished goods inspection, and testing. Maintains and improves product and operation quality by monitoring product requirements, SOP, compliance and technical support for the factory. Develops and maintains quality assurance and control objectives and coordinates objectives with production procedures in cooperation with the Production Department and others supporting departments. Develop a plan, promote, facilitate and organizes training activities for all respective person related to product quality and reliability. Continuously review quality control processes, procedures, and capabilities in order to sustain the most cost-effective and efficient methods for meeting quality requirements and making a recommendation for improvement as appropriate for Garments factory. Responsible for buyers any quality inspection failing; final inspection, in-process/inline quality audit and inspection. Responsible for customer (buyer) quality claim and giving on time customer feedback in any quality issue. Responsible for all Technical Audit and implementation of customer technical requirement. Should have knowledge of all aspect of quality control methods and practices including AQL levels and other prevailing international standards. Implement QC tools, lean manufacturing, and quality visualization.